A year ago since last year’s pre-season against Gretna, in which both Young brothers scored. This time around there were no Young’s in the line-up. New boys in the starting eleven included Jim McIntyre, making his first appearance in the black and white, and trialists Dorus De Vries and Owen Morrison. At the back were McCunnie, Shields, Wilson and Campbell, with Daquin, Phinn, Simmons and Morrison across midfield, and Morrison, McIntyre and Burchill up front, and Morrison joining them on occasion. In the 5th minute Innes gifted Mcintyre the ball in front of goal. Rather than shoot, he rolled the ball into the path of Burchill, whose shot was saved by Main, but fell again to McIntyre. This time his shot was hit by Birch into the back of Alan Main and rebounded into the net. A comedy of errors from Gretna, but 1-0 all the same. McIntyre and Burchill should both have netted from their opportunities though. In the tenth minute Wilson tried to dribble his way out of defence and lost the ball which should have resulted in a goal. But a minute later, after a promising attack by the Pars with Daquin down the right, Morrison`s shot was blocked and Gretna came up the field. Deuchar found Campbell to be no obstacle and he slotted the ball neatly past De Vries for the equaliser. In the 17th minute McIntyre had a shot from close quarters turned round for a corner by the defender. Pars continued to create opportunities and in the 20th Daquin found space in the box, but his shot was again deflected for a corner, this time cleared by the fist of Main. Freddie Daquin v David Nicholls. Grady forced a close quarters save from De Vries in the 21st, and Grady’s attempt from the rebound looped over the bar and onto the roof of the net. Coming up the field Freddie played in a long cross which found Mcintyre at the back post and his shot was once more turned round for a corner. There were signs that his first goal may come before the end of the game. As the first half passed Gretna began to dominate and Pars were finding it difficult to get out of defence. Many of Pars forward passes were either finding the opposition, or one of their own already. Greg Shields v Kenny Deuchar. In the 35th McCunnie was posted absent at right back and Skelton had plenty of time to set up McGuffie for a shot which skidded off the top of De Vries`s crossbar. Gretna continued to press with slack passing in Pars` defence from Phinn amongst others, and Gretna looked the most likely to step in front. With the half ticking away Grady met a cross from Tosh and sent his shot just wide of the post, completely untroubled by any Pars defenders. At the other end, a move between McCunnie, Daquin and McIntyre fell apart first from a complete lack of any idea about how to break through the defence, and eventually from a slack pass by Freddie which sent Gretna on their way again. Dorus De Vries v Kenny Deuchar. raig Wilson and Andy Tod came on immediately after this and Simmons joined Tod in the centre of defence, while McCunnie pushed into midfield and Craig Wilson at right back. Not long passed before Toddy was beaten one on one, leaving De Vries to make a save to keep the Pars in touch. From Skelton`s corner Deuchar managed to get a touch to the initial header from Canning and the ball crossed the line from the underside of the crossbar.63 minutes gone, and the Pars looked dead and buried, and at serious risk of being on the end of an even worse defeat. Those looking for a step up from McCunnie and Ian Campbell would have been disappointed. Scott Wilson made mistakes, and the midfield was unimpressive. At the end of the half, it seemed that either Gretna will slot neatly into the bottom of the SPL, or the Pars will find their level in the First. Gretna kicked off the second half with Pars unchanged, while Gretna changed six! Main, Birch, Tosh, Innes, O’Neil and Grady all went off. Gretna at this point were also playing with two number 16s, both of whom were listed as 16 on the team sheet! With this much change Gretna still continued to press and won a free kick when Wilson upended Skelton 30 yards out. The free kick was wasted. In the 54th minute a missed offside decision against Skelton set up Deuchar to run through against De Vries. With the ball well out of his control Deuchar dived across De Vries`s hands and found himself with a penalty, which was neatly converted by McGuffie to put Gretna ahead. Two minutes later McGuffie was one on one with De Vries again and blew it, putting his shot wide of the left hand post. 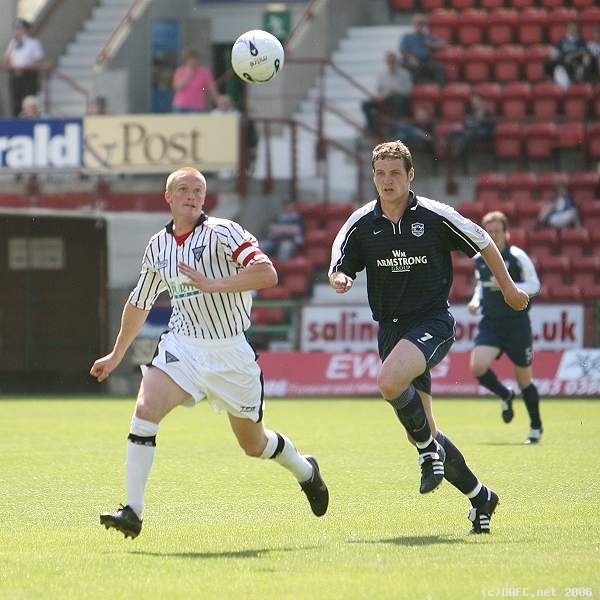 But Pars were on the rack and struggling with a complete lack of defence.